I am so excited to be writing this post today because it's only a month until everyone goes back to school/college or maybe even University. I personally go back to University at the end of September, however I go back to my job at a Primary School on the 2nd September which is less than a month away now and I couldn't be more excited. I'm ready to go back now. I always go completely crazy when all of the back to school stationery items come into stores and I can't help but go over the top and get too much. But, you can never have too much stationary. 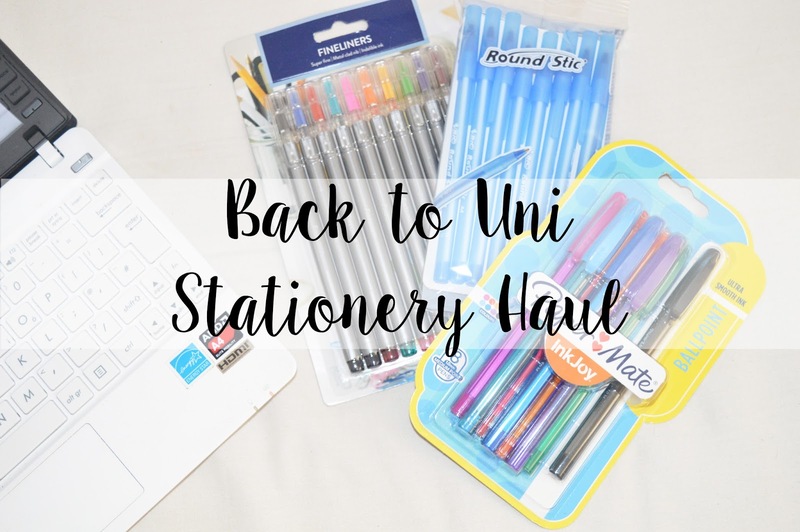 If you want to find out what stationary items I picked up this year, then carry on reading! The first item I picked up ready for University is this set by Pukka Pad. This includes so many different things and originally it costs £22, however I picked this up for £8 from Tesco. This includes a lever arch folder which are absolutely perfect for studying because of how big they are, three different size notepads including an A4 one; a presentation folder, plastic wallets, a pen, pencil and rubber. Pukka Pad are such a great brand when it comes to stationery and I absolutely adore the colours they bring out. I picked up the pink and purple set this year, whereas last year I picked up the green and purple set. I know this year they also brought out a blue and green set but I really fancied having some pink in my stationery this year. The quality of Pukka Pad paper is insane! You can go to some shops and pay a lot of money for a notepad but the quality of the paper is rubbish and quite thin but this is just superb quality and for the price, I couldn't be more happy! The next items I picked up were in Poundland and Tesco. I really wanted to get another pencil case this year for my coloured pens, whether these were ballpoint or fine liners but I wanted to find one which I could see through but still had some colour too it. Some pencil cases are really bulky or far too small to fit anything in but I found this one from Poundland ticked all of the boxes. For only £1 I couldn't be more happy with it and the quality of it is great too. I also picked up a pack of highlighters from Poundland too as the highlighters I currently have are the very thick and bulky ones which take up the whole of a pencil case. These obviously were only a £1 too but for 8 highlighters in various colours, this is great for studying! From Tesco I picked up the most gorgeous fine liners for only £2. There are 10 altogether and they are all in different colours. I really recommend fine liners for studying because they're perfect for underlining key points, or even for writing with because they're thin enough! It makes your studying so much more fun than writing with a standard black pen and everyone loves to add some colour to a page! I also picked up Tip-Ex. This stuff is a complete life saver when you're at college or University. I am a complete weirdo when it comes to writing down notes and I can't have a page of notes which have scribbles on or crossing outs so Tip-Ex comes in handy when I want to cross something out but still have a pretty page with no lines going across it. I go through so much of this when I am studying and for three bottles, it only cost £1.50 at Tesco too. Whilst in Tesco I also picked up another lever arch folder because this semester I will be studying two modules again. I like to use lever arch folders for my modules because it keeps everything separate and I know exactly where to find everything; this was only £1.50 and is another Pukka Pad one. I also picked up five folders with the press stud on them because these things come in handy when you need to take important pieces of paper some where but you don't want them getting creased, these were around £1 I think! It also keeps things separate at University when you don't want to take your lever arch folders every time you have a lecture but you still need to bring the important documents such as reading lists and module guides. Therefore, I will use one of these for each module too. Of course if you have a folder, you are going to need the page dividers. I picked these up in Tesco also for £1.25 which come in handy to separate different areas of a module within my folder. Last but not least I picked up one of the 400 page refill notepads by Pukka Pad for £1.50 also. I also get through so many of these throughout an academic year. They are absolutely brilliant because you can tare out pages without having horrible rips going down your page. They are value for money and Pukka Pads are brilliant for the quality of their paper. While all of the stationery items are out in store, I wanted to pick up my lever arch folders for my second semester at University while they are around. I went into Wilkos and picked up two folders for £2 or £3 altogether so they were inexpensive! Obviously I would also need some more page dividers for my second semester so I picked this pack up for only 30p also in Wilkos. We cannot forget punched pockets or whatever you call them (Everyone has a different name for them). These were 80p I believe for 50 high quality wallets. You will need these if you are a college or university student. The amount I go through in an academic year is absolutely crazy. I probably bought about 6 or 7 packs of these for my time at college which is ridiculous but an essential if you're studying. Last but not least, I had to pick up the Bic Cristal fun ballpoint pens. I really like these pens because they come in such fun colours and the quality of them are brilliant. I especially really enjoy using the pink ones because they're a colour you never thought you'd find in a high quality ballpoint pen. I gave so many of these away last year because people at work loved them but you can only get them in the Summer when back to school stationery comes out in store. So I need to restock now I only have a few of the pens left from last year! As you can see, I went a bit mad when it comes to pens this year and I did buy quite a lot! Paper Mate Inkjoy pens are also another great brand when it comes to general writing pens and I love these just as much as the Bic ones. I decided to pick up a pack of 8 standard black pens which are so easy to write with and as they mention on the packaging, the ink is so smooth to write with too. These were only £1.50 in Tesco. I also picked up the Paper Mate Inkyjoy pens but the colour set which includes; two shades of blue, pink, red, orange, green, purple and black. I know I really like the Bic coloured pens and I generally love to use the black Paper mate so these are a new try for me but I know I'm going to love them! They were also only a pound in Tesco. I'm not sure how many times I have mentioned how much I love Bic pens but one colour I tend to never use is blue so I wanted to make a change this year and purchase a pack blue Bic Round Stick Pens. These were a pack of eight from Poundland which is a great price for high quality pens! Last but not least, I picked up the most beautiful sticky note set from Poundland. This includes three different colour sticky notes. The pink one says "Do Not Forget", the green says "To do" and the blue says "Ideas". I really thought this would be perfect for either blog posts or studying at University too. I thought they were so cute and I couldn't help but pick them up for only £1. This is absolutely everything I have picked up for University this September. I did have quite a lot left over from my first year, but I couldn't help but buy some more! Let me know what your favourite stationery item to use is.